Some of the very first things that were added when I created the Historical Archives were maps I found thanks to the Library of Congress. It was interesting to see the network of railroads in the country grow in size exponentially through the 1800’s, and then later in the mid 1900’s crash and quite a few disappeared. There was one map, however, that caught my attention. That map lists a station along the Harlem Line: Golding’s Bridge. Was it a typo? In the back of my mind I had always wondered about the apostrophe thing. Is Goldens Bridge written properly with an apostrophe, or without? And now, a new question. What is Golding’s Bridge? For whom was the town named, and does the bridge still exist? Why are other stations on this map, or other maps also listed with apostrophes? Brewster’s, Pawling’s? The map also lists quite a few stations that have different names today, such as Hart’s Corners, Whitlockville, and Bains. I’m not exactly sure where the original bridge that gave your hamlet its name first stood, but it spanned the Croton River, which is now under the reservoir. The bridge may have belonged to a gentleman called Golding, Goulding, or Colden. I have heard all of these names. That bridge had to have been an important crossing to get to what is now Somers, and points west. It most certainly dates to the Revolution or before. In 2003, Metro North dropped the apostrophe from the name of the station. Almost all official timetables and signage refer to the station as Goldens Bridge. However, old signage with the apostrophe does still exist. The station listing on M-7 trains still has the apostrophe. Most official town signage also does not have the apostrophe. However the Fire Department for the town still uses it. Google maps still uses it. It is a name still in transition. 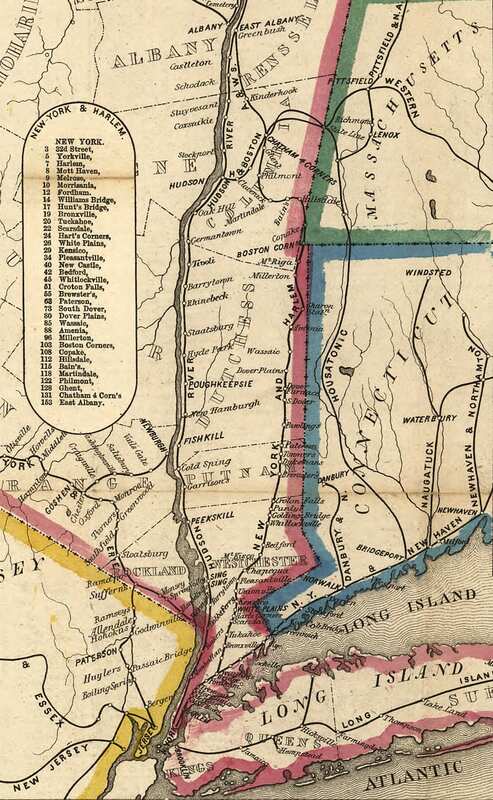 Many towns and names along the Harlem Line went through similar transitions. Spellings were changed, apostrophes were dropped. Brewster’s and Pawling’s are both evidence of that. Some names changed completely. So let’s take a little tour through the area and see how some of these names came to be, shall we? Bronx – Named for Jonas Bronck, who purchased the land in 1639. Originally known as The Bronck’s, in reference to the family, at some point over time the spelling evolved into the current form. Mott Haven – Named for Jordan Mott, who had an ironworks that opened in 1828. He purchased the land from the Morris family. Morrisania – Named for the Morris family. Lewis Morris was a signer of the Declaration of Independence. Gouverneur Morris was also a prominent member of that family. Woodlawn – Originally two words, but was condensed into one by 1870. Mount Vernon – Named for George Washington’s home. Original name was Hunt’s Bridge. Fleetwood – Named for the ancestral home of John Stevens. Scarsdale – Named for the ancestral home of Caleb Heathcote. Hartsdale – Named after Eleazar Hart, who donated the land. Was previously known as Hart’s Corners. Bedford Hills – Originally named only Bedford, the Hills was added to the name in 1910. Katonah – Had several previous names, first was Mechanicsville. Later changed to Whitlockville in 1830, for the Whitlock family. Later renamed Katonah from the native word Ketatonah, which translates to Great Mountain. Purdys – Named for Daniel Pardieus, his grandson Isaac donated the land to the railroad in 1844. Brewster – Named for brothers James and Walter Brewster, and at the time was known as Brewster’s. Dykemans – Named for Joseph Dykeman. Pawling – Named for the Paulding (possibly Pauling) family. Wingdale – Named for the Wing family. Jackson Wing operated an Inn which opened in 1806. Previous names include Wing’s Station, and South Dover. 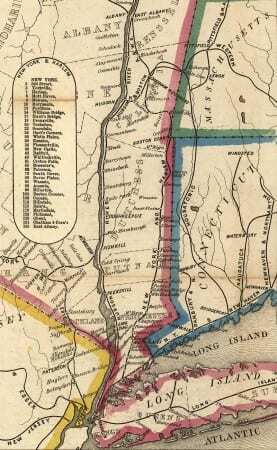 Harlem Valley – Wingdale – Harlem Valley comes from the name of the railroad (New York & Harlem). Used to be two stops, State Hospital (actual name of the hospital was Harlem Valley State Hospital) and Wingdale (mentioned above). Wingdale station was eliminated, and later Metro-North combined the two and the name. Millerton – named for Sydney G. Miller, who was an engineer and contractor for the construction between Dover Plains and Chatham. Craryville – Named for Peter Crary. Station was previously known as Bains, or Bains Corners for hotel owner Peter Bain. Martindale – Named for John Martin. Philmont – Previous name was Phillips Mountain, but was later condensed into Philmont. Named for George Phillips, who built a dam and a mill in the area. Chatham – Named for Lord Pitts, Earl of Chatham, England. That list does not mention every station on the current Harlem Line, or the rail line in the past. I am specifically mentioning stations that were named after people, or had a name change of some sort. Apostrophes in names often originated because the land was named after, or originally belonged, to a specific family or person. Nothing of note to say, but just wanted to let you know I’m reading and finding most of this stuff fascinating. Thanks! I often wondered about the lack of an apostrophe in “Purdys” when I see that name flash across the display in White Plains. I didn’t realize how many other questionable non apostrophe-d names there were! I knew how the Bronx got its name, but didn’t know about any of the other families. Very informative! I always wonder when the railroad is going to finally get rid of that apostrophe in Purdys for good. Interestingly, the town historian told me that when Metro-North was updating the stations they actually consulted her as to whether Goldens Bridge should still have the apostrophe. They came to the conclusion that it was no longer needed, hence the change in 2003. I totally expected to hear that Metro-North just randomly decided to do it for who knows why. I found the spelling of Chappaqua as “Chapequa” very interesting. I had seen Shapequa as the spelling of the original Native word for flowing water, but not ever have I seen Chapequa on a map. Ah, our public schools! Up in Vermont, they changed the name of a mountain. Camel’s Hump is now Camels Hump. Of course they do! So do dogs! An English instructor at the University of Vermont said it would be easier to teach without all the punctuation and would make his ‘job’ easier! As a newcomer to the site, I haven’t noticed any reference to my bible on the Harlem: “The Coming of the New York and Harlem Railroad”, by Louis V. Grogan (1989) of Pawling, NY. Outstanding work by an employee, and extended-family member of many Harlem Division railroaders.